Koji(Otsukare). Is it OK to talk now? SanaeNo problem. I've just got out of the bath. Koji Perfect timing! Where are we going to meet tomorrow? SanaeWe said that we would go to an art museum in Roppongi, so what are we going to do? Will we meet at Roppongi station? KojiWe will be hungry so let's eat something first. SanaeSounds good! Do you have any recommendations? KojiNo plan (Nope) ! Why don't we wander around Shibuya and find somewhere? It's on our way. Koji OK. So, see you tomorrow at 12 noon in front of Hachi-ko, at Shibuya Station. SanaeDeal! Oh! There is a store I want to go to in Shibuya. May I stop there for a little while after having lunch? KojiSure. Will you buy something? SanaeWell, I lost a pierced earring the other day, so I wanted to buy a new one. It won't take too much time. Koji Don't worry. It's our day off, so let's take it easy. SanaeWe have been so busy, it's been a while since we have relaxed. KojiYou're right. I hope it will be fine tomorrow. SanaeI hope so too. 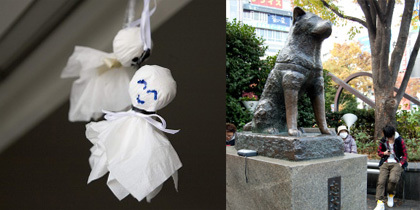 I will make Teru Teru Bozu, just to be sure. KojiWell, I have to go now. SanaeOK. Thank you for calling. See you tomorrow! KojiYes, see you then. Have a good night. Commonly "疲（つか）れる" translates into English "be tired", therefore "おつかれさま" directly means "You are tired." Strictly speaking "おつかれさまです" is used to show appreciation for hard work, but actually the usage is really broad. It is most commonly used when fellow workers use the phrase at the end of a working day, in the past tense "おつかれさまでした" to show appreciation or acknowledgement of others who have put in a hard days work. While, in many casual settings it is just like saying "hi" or "how are you?" or "how's it going?" or whatever you use as a greeting. Japanese people usually place importance on greetings and we use them all the time. "おつかれさまです" can be used both at the start or end of the conversation. It is one of the Japanese customs and is a doll which is wrapped in white cloth or paper. "照（て）る" means sunshine and "坊主（ぼうず）" means a kid. It is said that when it is hung under the eaves of houses, it will be fine the next day. Also it is said that if it is hung upside down, it will rain the next day.